It’s the Age of the Customer, the era of the Internet of Me. Brand names and physical footprints are no longer the decision-drivers they once were. Brand loyalty can fall by the wayside as consumers turn their trust to whatever they can pull up on their smartphones, from peer reviews to best-selling item rankings. Trends like these have triggered seismic shifts in the brand-customer relationship. For example, a brand must now demonstrate its care and commitment to the consumer before the consumer will commit to the brand. And what criteria do consumers use to determine that “this brand cares about me”? The benchmark is being set by brands like Amazon, Uber and Starbucks that excel at using technology to recognize individual customers and apply their knowledge of each person to deliver experiences that are personalized, connected, and easy. What does this mean for B2C marketers in industries like retail, travel, and gaming/entertainment? Let’s take a look at three significant findings from new research by Wunderman that highlights what today’s empowered consumers expect from the brands they do business with, and as a result, why marketers must totally rethink their approach to customer interactions. Old thinking: Brand marketing aims to change consumer perceptions and behaviors in order to make people care about the brand. New thinking: A brand must now demonstrate commitment to the consumer and make the consumer feel wanted before the consumer will commit to the brand. Translated into marketing terms, this means getting down to a one-to-one level with the customer. When returning customers interact with a brand, they expect to be instantly recognized and receive a customized experience based on their prior brand interactions. 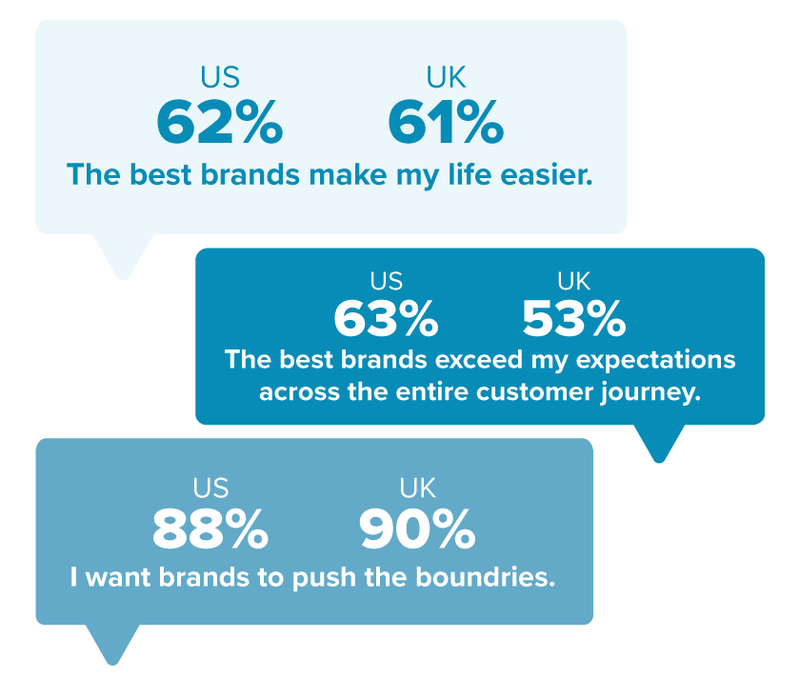 The payoff for the brand: over half of consumers feel more loyal to brands that show a deep understanding of the consumer’s priorities and preferences (56% US, 54% UK). 2. 87% of US consumers (85% in the UK) measure all brands against the yardstick of mobile experience leaders like Amazon and Starbucks. New thinking: Consumers now evaluate every brand experience against their best experience across all product and service categories. “Best” is defined by customer experience innovators like Amazon, Airbnb, Uber and Starbucks, all brands that excel at taking friction out of everyday activities like shopping and traveling. Specifically, consumers say the best brands make their lives easier, exceed their (already high) expectations and push the boundaries with product and service innovation. 3. 90% of US consumers (89% in the UK) believe mobile enables them to make better purchasing decisions. New thinking: It’s virtually impossible to measure up to the “best” brands without a fast, intuitive mobile website and app. Mobile’s rising importance is underscored by its rising share of total e-commerce, which nearly doubled from 11% in 2014 to 20% in 2016. But remember that mobile devices aren’t used in isolation. A great mobile tool needs to integrate seamlessly into an omnichannel brand experience that includes other devices and physical venues. The brand thereby proves its commitment to the customer at every human, physical and digital touchpoint. 1. Benchmark your customer experience against the best. Examine your customer journey map and look for ways to reduce friction and add value that will be buzzworthy — so emotionally engaging that consumers remark on their experience to others. For example, apply your knowledge of an individual customer’s historical behaviors to help them complete brand-related tasks more quickly and to deliver personalized recommendations and offers. Look to Sephora as a role model; customers particularly appreciate the any-channel (web, app, or in-store) access to their entire purchase history and personalized recommendations. 2. Make identity resolution a top priority. The ability to recognize customers at every touchpoint is the most essential capability for enabling contextual marketing. Adopt a strategic approach to identity that bridges every channel and device and provides a single customer view. It’s the prerequisite for delivering an experience that feels individually tailored. The Disney World My Magic+ experience is a great example; customers rave about the convenience of using their magic wristbands to open hotel doors, pay for food, collect souvenir photos and enter FastPass rides. 3. Create a mobile experience that doesn’t just satisfy but delights. Examine not only the standalone functionality of your mobile website and app but also how well it’s integrated with other customer touchpoints. Carnival Cruise Line’s new Ocean Medallion Class experience is inspiring; each passenger’s personalized Ocean Compass, described as a digital concierge, can be accessed not only through a smartphone app but also on stateroom TVs and touchscreens throughout the ship. The customer-facing Compass app also interfaces with the ship’s staff-facing systems to simplify customer activities such as boarding, restaurant ordering and shopping. To boil it down: In today’s hyper-competitive marketplace, the brand has to express its loyalty to the customer on a personal level before the customer will award their loyalty to the brand. While you can’t create loyalty through marketing alone – the product or service usage experience plays an obvious role – marketing can play a major role in making your customer feel special and cared for. Showing your customers that you recognize and remember them – every time, at every touchpoint, is a great place to start.